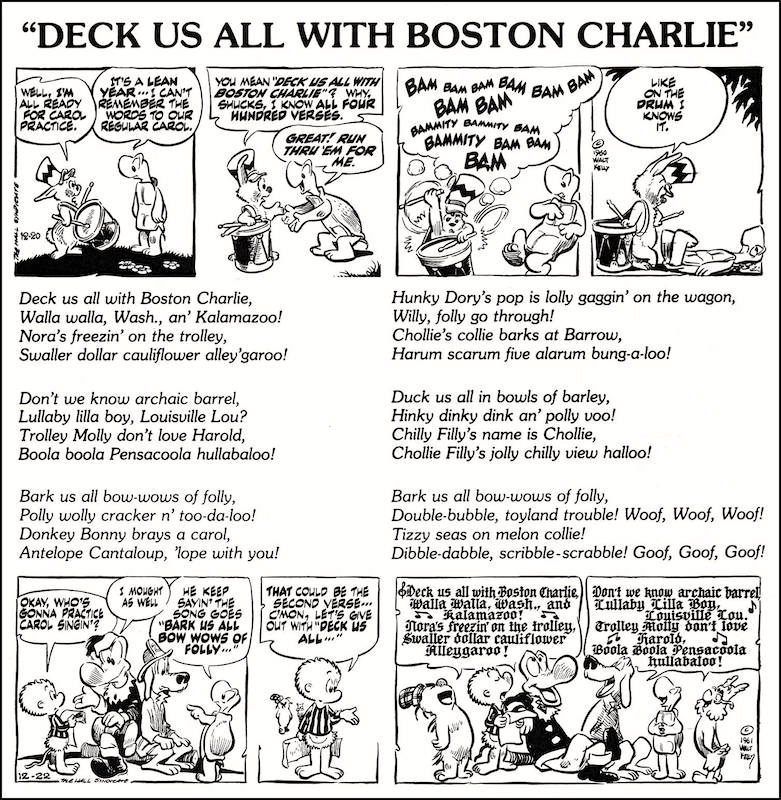 On Walt Kelly’s inspired nonsense parody of the winter carol in my blogging: a 8/1/07 LLog posting “Cousin of eggcorn”; and a 7/21/12 posting on this blog, “The Pogo files”. “Deck the Halls” or “Deck the Hall” (which is the original version of the lyrics) is a traditional Christmas, yuletide, and New Years’ carol. The melody is Welsh dating back to the sixteenth century, and belongs to a winter carol, “Nos Galan”, while the English lyrics, written by the Scottish musician Thomas Oliphant, date to 1862. … The phrase “‘Tis the season”, from the lyrics, has become synonymous with the Christmas and holiday season. in journalism the resort to trite language appears to be understood as an honorable ritual rather than as a failure to recognize the hopelessly hackneyed. So, for you who have ears to hear, the Holiday Cautions. Chestnuts roasting by an open fire are fine, but they can be kept out of copy and headlines by the vigilant. “ ’Tis the season”: Not in copy, not in headlines, not at all. NEVER, NEVER, NEVER, NEVER, NEVER. You cannot make this fresh. Do not attempt it. … Some readers (and, sadly, some writers) lap up this swill. It is familiar, and the complete lack of originality comforts them. It is for such people that advertising copy is written. There you will find ’tis the seasons in abundance, and you will now understand them to be a mark of intellectual and imaginative impoverishment. But “Bark us all bow-wows of folly” and “Duck us all in bowls of barley”, now those are fresh lines that will truly catch readers’ attention. Only last week I stir-fried an assortment of sliced vegetables with strips of beef, to serve over mounds of cooked barley, for the traditional Advent Bowls of Barley. This entry was posted on December 12, 2018 at 5:08 pm and is filed under Catchphrases, Clichés, Language and food, Linguistics in the comics, Music, Nonsense, Parodies. You can follow any responses to this entry through the RSS 2.0 feed. You can leave a response, or trackback from your own site.